The brand name is Venus Fallen. My name is Matthew Haydu and I am the owner/art director. Thanks for having me! How did you come up with the name Venus Fallen? I sort of have a cynic yet immense love for the world we live in. I find that there will always be a pro and con, even for the most beautiful objects in life. The term Venus is symbolic of the Greek goddess of beauty, love, happiness, etc. The word “Fallen” is pretty self-explanatory. I guess you can say that I see a large portion of humanity living everyday being constantly focused on the negative, hurting the environment, or just being all around unappreciative. I view that as the fall of mankind, which is held back in my opinion by world religions, politics, and various forms of following rather than leading. I wholeheartedly believe that we should be teaching our children how to think instead of what to think, if you catch my drift. The brand strives to inspire individuals to a point of rapturous awe, in which trivial problems and negativity can no longer affect someone. It is all about overcoming the negative by being aware of the amazing positive. I’m from a small town in New England called Naugatuck, CT. I’m also a business major (MIS) finishing up my degree at SCSU in New Haven. I commute to school twice a week and work from home in Naugatuck. When people ask me this, I usually tell them I live in my mind. When did Venus Fallen launch? 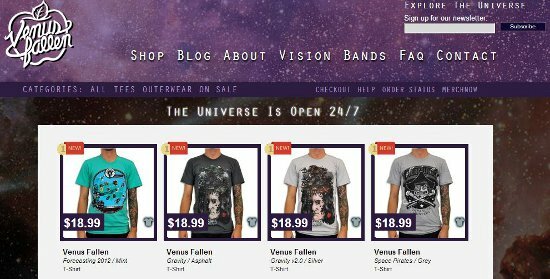 The first Venus Fallen collection was released in May of 2011. It is a fairly new brand so I’m extremely happy with the progress so far. Simply put, I had been involved with getting merchandise done for a local band of buddies that used to tour around New England. When I noticed their band fading away, I didn’t want to stop. I experimented with a few shops and designers and lost tons of money during the learning process. The inspiration came from my want to genuinely inspire people in a way that is mobile. Meaning, I let the art do the talking on my products and the fans get to enjoy spreading the vision behind each piece just as I do. I’m sort of a rebel when it comes to running this brand and running a business in general. In business school, professors constantly teach students to be as profitable as possible as a small business owner but I view profit as being something much more valuable than money. Though there will always have to be a balance but I will persistently strive to make emotional connections with fans that have nothing to do with financial success. That line from the about section denotes what themes a person can expect to see within a single concept. For example, the “For Carl” piece has all three elements and combines them to create a stronger message within the art. The sustainable culture reference is of course in relation to the competitive advantage I hold and how I’m using an inspirational appeal to build a respected consumer base that enjoy the brand’s vision. Is that related to the “progressive goals” that you have? Absolutely. I use this technique for two reasons: to have fun no matter what and to allow my creative side to continuously progress as time passes. The brand’s releases hint at what I go through during the creation period and how I choose to transmit my mind’s thoughts onto a visual canvas that people can wear. You promote three bands on your site. What’s Venus Fallen’s relationship with Periphery, The Safety Fire, and Corelia? The relationship I have with each band is great! To date, I have released 2 collaborations on my store for Periphery and one each for The Safety Fire and Corelia. Working with them is amazing because they love what I do and I love what they do; simple as that. I made sure to choose bands that were genuinely interested in my brand rather than just wanting free gear. My relationship with Periphery has been evolving heavily as of lately and they’ve become some really good friends of mine. Out of serendipity about two months back, Misha and I discussed a subsidiary of VF and that is when Spacetime Fabric was born. This line will launch sometime this November with 12 pieces that explore scientific humor. We’re really excited and it’s awesome to co-own a business with him. Here is the link to Spacetime Fabric’s Facebook page, which was recently created. You study science including astrophysics, anthropology, and philosophy. Are there any books/videos you recommend that would help the layperson wrap their minds around that stuff? Totally! I find it easier to perhaps name some authors first: Michio Kaku, Neil deGrasse Tyson, Brian Cox, Richard Dawkins, Sam Harris, and Peter Diamandis, just to name a few. Three books that I highly recommend regarding the realm of science include Abundance (Peter Diamandis), Physics of the Future (Michio Kaku), and Space Chronicles (Neil deGrasse Tyson). What differentiates Venus Fallen from all the others on the Internet? I think it is pretty clear to see that my unique sales proposition lies conceptually within my product. I strive to make great quality products that are unique and virtually impossible to find anywhere else. This lets me build a sustainable consumer base that enjoys what I do because I’m neither following a trend, nor am I treating them like an “uninvolved customer.” Fans are family and I definitely display a customer intimacy strategy while operating this brand. You recently launched 33 new items. Is that crazy? Exciting? What’s your favorite new thing in the shop? Definitely crazy, but in the best of ways! I’ve spent the majority of the last 6 months creating, shaping, and finalizing this collection. I’m the kind of guy who does this all for fun while putting all of my emotion and belief into the concepts. I recently just turned 22 and this brand is by far the greatest creative outlet I’ve ever made for myself in life. I don’t have a favorite piece and never will because of three reasons: I enjoy every concept and always make the best out of the idea so I never wind up releasing something I’m questionable about, I respect each artist and their contribution to my brand, and I don’t want any one piece to represent VF. All the pieces come together to create the collective mentality that the brand represents so I will continue to view my brand as being only as strong as the overall vision people get when viewing it in entirety. 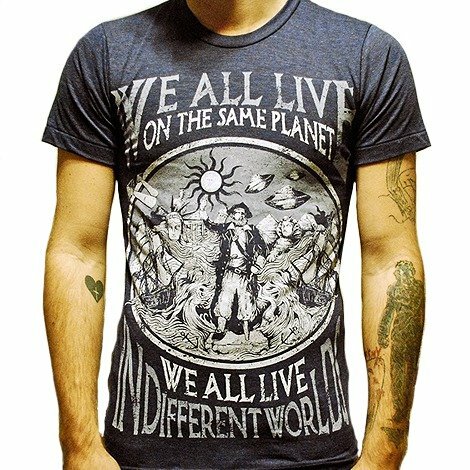 Tell me about the shirt design look Venus Fallen is trying to achieve. Every Venus Fallen collection explores many different scientific themes ranging from evolution to “end of the world” parodies. My main goal isn’t so much about creating a particular look. With VF, it’s about having as much fun with my concepts as possible. This is why viewers will see a variety in artistic style because the concentration is placed on the overall theme of the brand rather than a specific look. My main concern is to please not only science/space lovers, but to be aware of the subgroups within this common interest that enjoy particular styles of art. By offering something for everyone, I do believe each of VF’s collections have a greater chance of success as well as bringing in new potential fans. Considering that I am a futurist and believe 100% in technology, I view social media as marketing’s newest best friend. It’s proof when a huge company like Procter & Gamble fires their advertising agency when they realize they can just promote through social networks. The Internet is a neurosphere of ideas that can be instantly connected with people from all around the world. The fact that I can make a post and have thousands of individuals instantly see, partake and interact with my brand is a trippy concept in itself. Since 50%+ of my sales are global, I can safely say that my “digital billboards” or Facebook and twitter posts have allowed me to advertise for free and earn sales in other countries, rather than pay for one small advertisement billboard in Australia. The Internet is like an adaptable growing brain of internal information that grants so much potential for consumers, businesses, and any one person who wants information instantly at their fingertips. Anyone who enjoys science, outer space, or futurism is going to be the prime customer target. I’m making nerds (like myself) fashionable, which is an area that I think can be improved upon, haha. All jokes aside, the gear is definitely for someone who doesn’t mind trying to express his or her look with an intellectual foundation. This process involves me as the art director for my brand. The first step is concept creation. Once I come up with something I can visualize, as well as something I’m confident in, I choose a designer who I feel would suit the concept to its greatest potential. Then, the fun part starts! I type out the entirety of the concept’s art/visual direction so the designer is on the same page as me. Next, we start hashing out sketches and making any change necessary to bring the best out of the idea. The last step involves inking, coloring, shading, possible texturing, and separating the colors for the print shop. Every time I finish a design, it’s like I’m giving birth to a new cosmic canvas that individuals can wear to inspire themselves and others. It’s truly an awesome cycle. For garment blanks, I only use two specific companies as of right now. 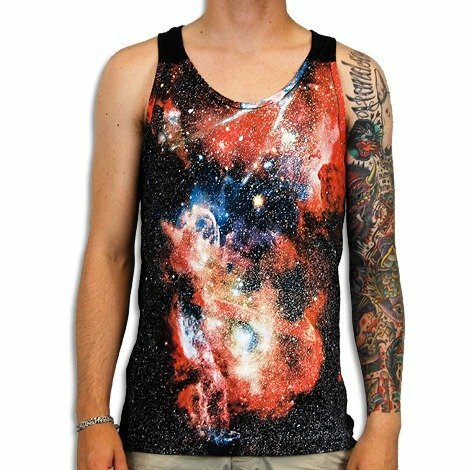 I print all of my t-shirts, tanks, and some misc. items on American Apparel. I print my hoodies on eco-fleece Alternative Apparel organic garments. In the fall, I will also be printing hoodies on American Apparel garments. Printing on these brands of blanks allows me to create a top-notch quality product for the consumer to ultimately purchase at a very affordable price point. What I’m striving for is to be vertically integrated with the company who fulfills my orders, MerchNOW. If I could work there as well as look over my two brands at the same time, I’d be a wonderfully happy man. I should be done with my degree in about a year so after that comes an interesting point in my life. Honestly, I’m just so stoked that within a year I have been able to quit my job and work from home full time on the brand. No favorites. 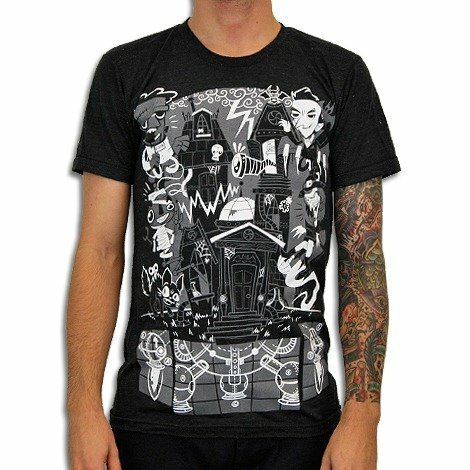 Same answer as before regarding my favorite design in the shop. I love them all! I print everything on unisex fashion fit garments because it’s the best way to please both crowds. In the grand scheme of things however, more men buy t-shirts and I think men’s sizes sell more than women’s sizes for the majority of indie brands. If I understand the concept correctly, I’d have to say that it’s fairly equal. If I had to pick, my best sellers in the past have mostly dealt with the singularity, evolution, or nebula photo-realistic artwork. I believe they are Anthropology, Nebula, and Flight of the Navigator. Absolutely not. That’s some just media hoopla generated to stir up some hype. Some people say there is a mysterious planet that follows a large elliptical orbit around our sun (different than anything we’ve ever discovered) that will come so close to the Earth that its gravity will eject our moon off into the solar system. This will leave our oceans subjected to the Sun’s gravitational pull and cause giant tsunamis worldwide. Of course, not one single astronomer has detected this mysterious planet. It’s all a hoax and everyone can sleep safely. There is a design titled “Forecasting 2012” in the new collection that mimics the various claims made by society. Most of my concepts come from my subconscious. I have this weird ability to remember vivid occurrences from my dreams. Most of the time, my concepts for pieces come to me in a dream, particularly when I’m not sober. When I wake up, I do my best to jot down all of the information, transform it into something that will work on a shirt, and then refine the idea.